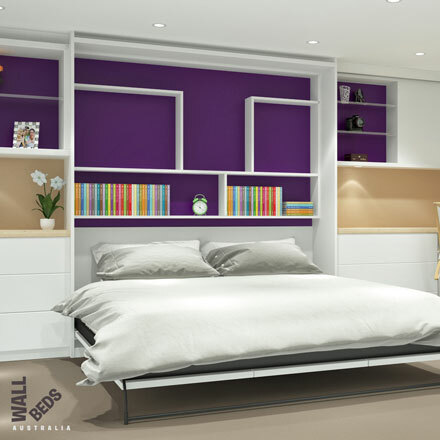 Wall bed specialists, Wall Beds Brisbane have the ideal space saving bed solutions for you. Longtime specialists in the art of wall bed design and creation, at Wall Beds Brisbane we provide you with only the best, most space-conscious beds for any living area. Most look to a wall bed for two simple reasons: flexibility and functionality. While many wall beds appear tacky, at Wall Beds Brisbane we have designed a product that is not only practical, but also stylish. In merely seconds, with our product, you can transform and enlarge a space, leaving extra room for a possible work area, a temporary living room, or just about anything else you can put your mind to. At nightfall, once again, the space can just as easily become a bedroom. Friends and family over? A wall bed provides a simple solution for accommodating them without the hassles of creating and maintaining a guest room. The practicality and uses of this wall bed extends only to the limits of your imagination. However, you might have concerns that a wall bed isn’t a good fit for your living area. If you don’t have an applicable wall space or if you’re renting and modification just isn’t possible, don't worry, we have the solutions for you. Through our complete cabinetry, specifically designed to contain the wall bed, you can place one in your home without having to worry about unwanted or prohibited changes. Are low ceilings also a problem? Not to worry. We carry an inventive horizontal design that enables you to install a Wall bed, in whatever space, whatever size. Although easy to use, here at Wall Beds Brisbane we do not believe that practicality requires a sacrifice of quality. Our beds incorporate a stylish design and are renowned for their comfort. Through the combination of this and ease of use, Wall Bed Brisbane creates the perfect alternative for a space-consuming sofa or spare bed. When a guest or family member comes to stay, one of the most time-consuming parts of their visit is making up the spare room. Here at Wall Beds Brisbane, we make it easy for you. You can leave the sheets, pillows and doonas readymade on the bed before folding it up into the wall. Unexpected guests? Simply lower the bed and, voila, they have a place to stay with no extra preparation. 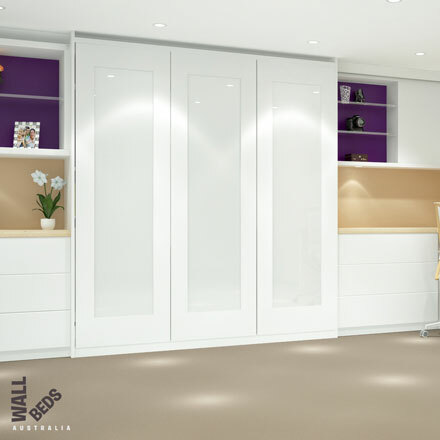 At Wall Beds Brisbane, we make the complicated easy, so when guests do arrive, you can have the extra peace of mind knowing that your wall bed is waiting for you. As said earlier, the Wall Beds Brisbane takes advantage of well-made, efficient hardware, tweaked over the years to provide you with the best product possible. Over time, we’ve made the frame stronger, increased the load bearing potential and opened up a whole new doorway to the potential of a counterbalance system. With this counterbalance system, your hidden wall bed no longer just has to be a plain, empty space. You can now attach televisions, mirrors and even a desk to the underside, that will all still fold up when it’s time to rest.